Fantasino Casino was established in March 2017, in cooperation with EveryMatrix, a company with a longstanding reputation in the online gambling industry. The site features licenses by the Malta Gambling Authority, UK Gambling Commission, and the Government of Curacao. 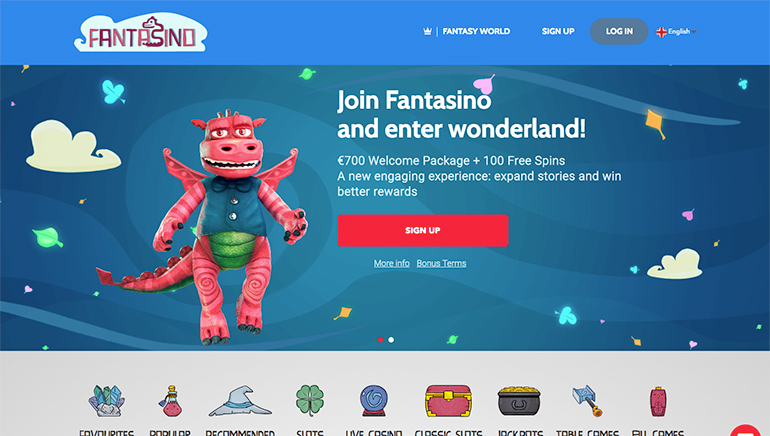 Unlike most casinos out there who use the same old approach to online gambling, Fantasino decided to take a different angle, creating an entire fantasy world inside the casino, significantly increasing the overall enjoyment and involvement. 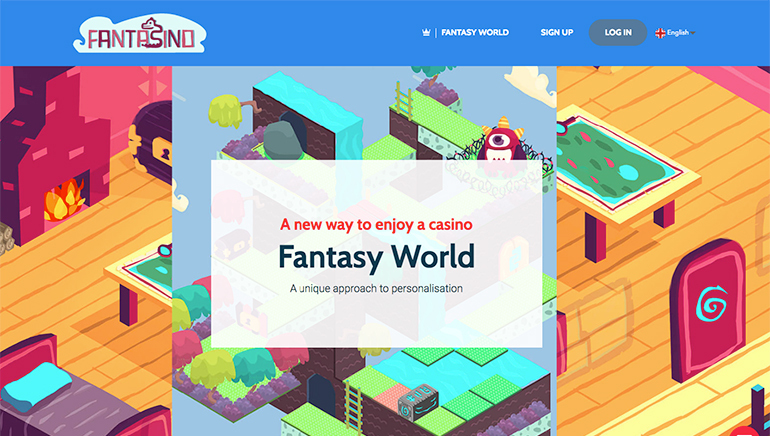 Fantasino Casino offers a colorful and cartoon-like user interface for their instant-play casino. 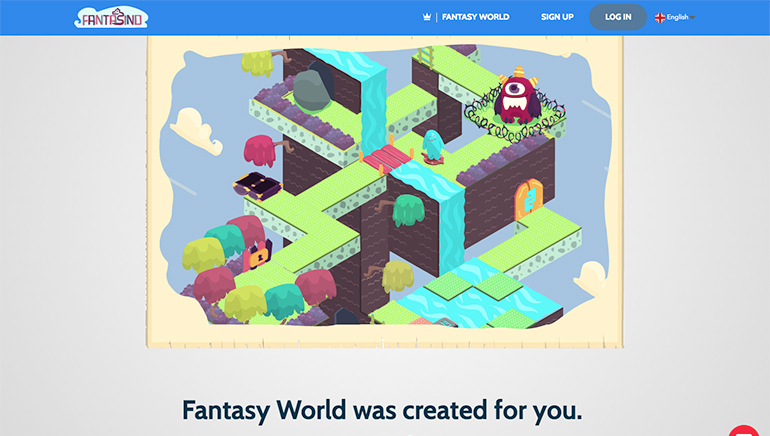 This design goes hand in hand with the entire fantasy concept, as it helps players feel like they have been transported into a completely new, different world, where many adventures await. After completing a quick and very simple registration process, every player is awarded their own Avatar, called Trebol. As players participate in different casino games, they earn Tokens which can be used to personalize your Trebol, buying him accessories, potions, and much more. Those most resilient can also unlock the next level of the Fantasy World, where they'll be able to build their very own world. Fantasino Casino can be played from desktop and mobile devices alike. The site has been designed using a fully mobile-responsive technology, meaning you'll have a great user experience regardless of the type of a device or screen size. Although Fantasino has created this novel and unique Fantasy World for their casino players to enjoy, they didn't forget about the most important aspect of every online casino: games library. The site launched with several hundred different casino games available, with clearly stated plans for expansion. As of now, there are about 1000 popular slots players can enjoy. These include well-known titles by the likes of NetEnt, Endorphina, IGT, Habanero, Betsoft, Quickspin, Play'n GO, Playson, Stakelogic, and more. With so many big-name suppliers, most players already know what to expect. Fantasino gives you a chance to try your luck with progressive games like Tiki Wonders and Geisha Wonders, and games like Mega Joker, Hall of Gods, and Mega Fortune. Other popular slots are there as well, so players can enjoy titles like Jack Hammer, Piggy Riches, Scarface, and Cleopatra, to just mention a few. Talking about table games, Fantasino has a really nice number of casino classics on offer. There are different variants of blackjack and roulette, together with baccarat, Casino Hold'em, Caribbean Stud, and more. Live Casino tables are provided by Evolution Gaming, which is a guarantee of a great gaming experience. Available games include baccarat, Casino Hold'em, roulette, and blackjack. Since Fantasino is a new online casino, most players out there will have a chance to take advantage of their generous first deposit bonus. The casino offers a fairly generous welcome package spreading over the first several bonuses, and it includes a lot of bonus cash and free spins. Wagering requirements on your bonus cash and free spins winnings are very player-friendly, making this bonus even more appealing. The welcome bonus isn't the end, though. In fact, it is just the beginning. 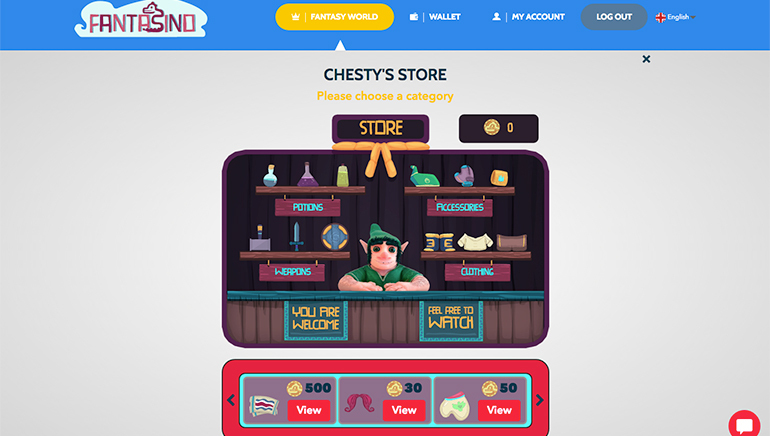 As you complete various quests and make your way through the Fantasy World, you'll earn various achievements and gather different items giving you a chance to claim bonuses, free spins, and cashback offers. Players have many options for depositing and withdrawing when playing at Fantasino Casino. The list of options includes Visa, MasterCard, Skrill, Neteller, Euteller, Trustly, Giropay, Ecopayz, Zimpler, Yandex, and Entercash. Most deposit methods are completely free and involve no fees, except for Visa, MasterCard, and Maestro (2.5% fees). Withdrawals are free and take just 24 hours to process, except for bank transfers, which take 1-3 days to complete. 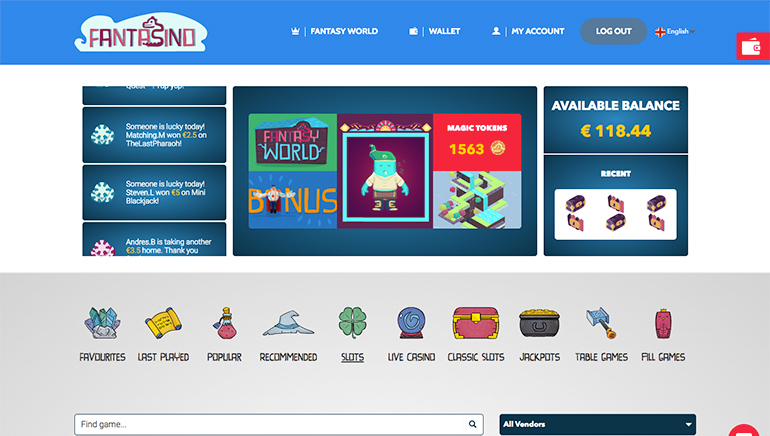 Fantasino Casino complies with standard legal regulations, requiring them to implement KYC procedures for players withdrawing more than €2,000 in accumulated cashouts. Currently supported currencies include Euros (€), Australian Dollar (AUD), British Pounds (£), NOK, and SEK. The customer support is one of the things Fantasino Casino puts a special emphasis on. You can expect friendly and highly trained staff always ready to answer your questions in a polite and helpful manner. To achieve the highest possible levels of customer support, Fantasino based their Customer Support department in Costa Rica, relying on the friendly and service-oriented culture of the people of Costa Rica. Support agents can be reached 24/7 via telephone (UK), email, and Live Chat. Support is available is currently in English language only and support in more languages are to be added in the near future.